Do Whitetail Deer Lose Their Antlers Every Year? 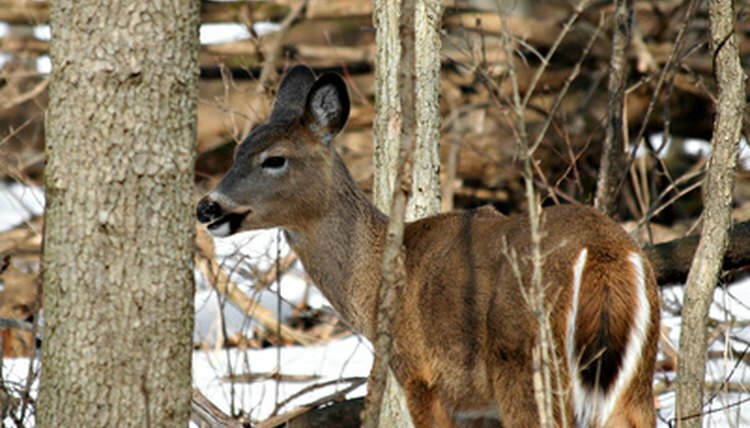 White-tailed deer, or Odocoileus virginianus, are the smallest deer found in North America. These herbivores can be found from the southern regions of Canada down to the borders of South America. As their name suggests, white-tailed deer have a distinctive white streak on the undersides of their tails by which they can be identified at a distance. Only male white-tailed deer (bucks) grow antlers, which are covered in sharp points known as tines. In 2000, the hunter Mike Beatty shot a 39-point buck in Ohio; seven or eight points on each side is more typical. Some people think that deer antlers are made of finely twisted hair, like rhino horn, but in fact they are made out of bone fed by blood vessels. Antlers begin to grow annually in April or May, and up until September are covered in soft velvet to protect them during the tender developing stage. Antlers are then shed between January and May, depending largely upon the region in which the deer is found. Therefore, white-tailed deer do indeed lose their antlers every year. It takes between 7 and 8 years for a buck's antlers to achieve maximum size, and they can grow at a rate of half an inch per day between May and September.